I hosted a waffle brunch once. It’s true. Have you ever attended a waffle brunch? It’s a breakfast party wherein the host provides hot, fresh waffles and the guests bring his or her favorite toppings. It’s like a waffle bar, and it’s quite lovely. You know what? You should host one yourself. And if you do, be sure to have plenty of this simple, 2-ingredient compote on hand. It’s sure to be the most popular topping of all. For my waffle brunch, my friend Lauren made a version of this compote, only she went with fresh ginger and blueberries she picked from her garden. Yes, she’s that cool. Anyway, I’d never made compote before and she taught me how. The concept is simple: Throw your favorite fresh or frozen fruit (berries and stone fruit work best) into a pot and add a little juice to get a sauce going. If your fruit is sour, add a little sugar. For more flavor, add ginger, cinnamon, or another spice of choice. For this very summery version I went with half cherries, half strawberries and a splash of orange juice for a fresh citrus touch. You get the drift. It’s so warm and fruity and delicious you’d never guess it was mega healthy for your bones. If you make this compote, let us know in the comments or by tagging a photo #minimalistbaker on Instagram. We love to see what you’re cooking up. Cheers! 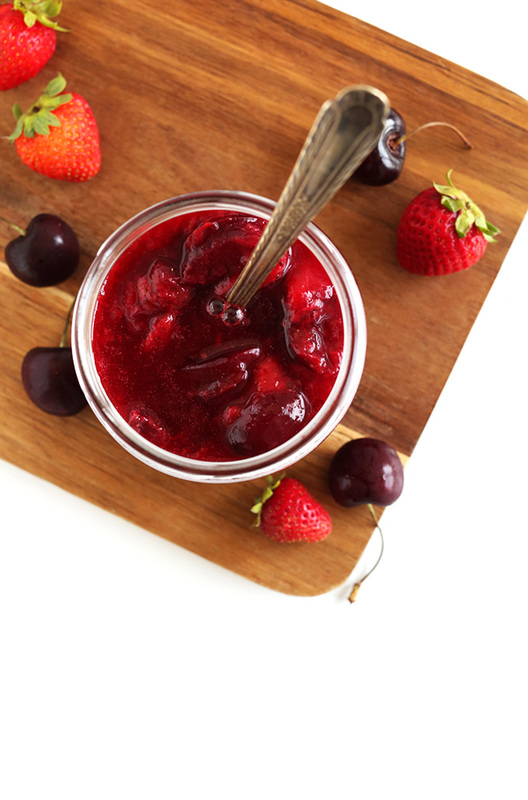 2-ingredient fruit compote that requires just 1 pot and 15 minutes! Perfect for waffles, french toast, sundaes, oatmeal, and more. 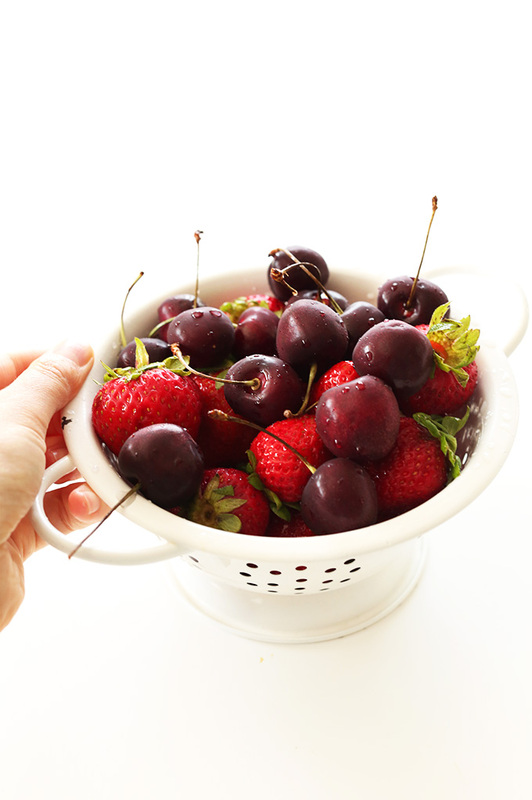 Place fruit and juice in a small saucepan and bring to medium heat. Remove from heat and transfer to a clean jar or container to cool thoroughly. Store in the fridge and reheat to serve with french toast, waffles, pancakes, oatmeal, ice cream sundaes, and more. I made this and it turned out to be a soupy mess. It needed a thickening agent of some type. I made exactly as the instructions said and i had to throw it out. My waffles were a soggy mess. The compote I get at a local restaurant is nice and thick and sits on top of my waffle without sinking in too much. I was hoping for something similar with this. Up to 4-5 days. Freeze after that (which you can do in an ice cube tray for more serving-size appropriate portions)! Yum! I just made this with frozen strawberries, lime juice instead of orange juice, and 2 tsp of sugar (I might use maple syrup next time). Eating this on top of chia pudding right now! Hi I live in the Caribbean where Strawberries and Cherries are very very expensive. What tropical fruits can I substitute to make this compote? Hi Nilia! 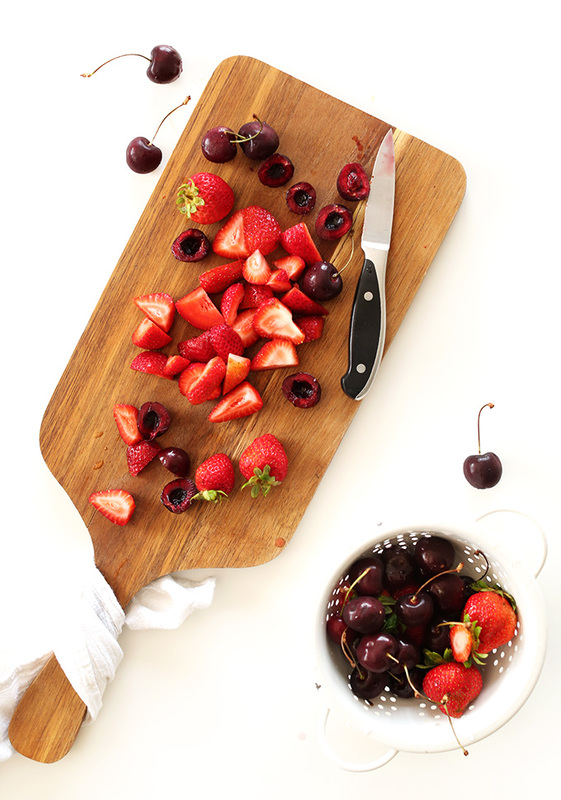 You can use a variety of fruits and berries to make a compote. Depending on what produce is available in your region, you can tailor the recipe to fit your liking but you could use peaches, blueberries, raspberries, or even apples. Hope this helps! Some earlier posts include banana in their adapted recipes, combined with some other berries, and one poster said that mango works nicely, but papaya is too dense. Had some waffles I froze a couple weeks ago and needed a quick breakfast for my boys. I made this (mostly for me) with strawberries and blueberries. I didn’t have orange juice, so I used CHERRY Juicy Juice. It was amazing and soooooooo simple. My picky son, isn’t a fan of blueberries, but my youngest loved it. Thanks. Just made this for breakfast on pancakes. Used frozen blueberries and Stevia instead of sugar. Yum! Hubby loved it too. ? he pulled out the syrup before starting in case he didn’t like it. The syrup wasn’t opened. I love making this compote! I use whatever berries are in season and on sale and double or triple the recipe. I’ve made single berry flavors and mixed berry flavors. It freezes really well and makes a terrific homemade gift. Straight blueberry with orange juice is my favorite. This has become one of my favorite go-to recipes! I make this just using berries, water, honey and chia seeds. I refrigerate in small mason jars and then I can bring with me for healthy and delicious eating. So many ways to enjoy not just cakes or waffles! I made this with equal parts strawberries, blueberries, and bing cherries. No sugar. No juice. Added a little vanilla bean. Served it over brownie “cake” with whipped ganache icing. It was a big hit. ? Delicious! I’ve been following you guys for awhile now and all the recipes I tried turned out so good! Gratitude and appreciation for your work! Here in Norway is berry season now and we are blessed with different types of berry bushes in our garden. Made this today with my kids( 4 yrs and 22 months) and they enjoyed so much the process. Going to do again for sure! I used marionberries and raspberries I needed to use up, and added some brown sugar and pumpkin spice. Its delicious and was super easy to make after referencing this recipe! Thank you! I’m excited to try it on my marionberry cornbread! Hot damn! This was so easy and so yummy! I used some strawberries that were starting to look a little busted and threw in some TJ’s frozen berries. I added a splash of TJ’s maple, a touch of cinny, and some minced fresh ginger. Bomb! Just tried it out and it’s super simple and yummie! I was wondering if this would work with mango and chia seeds? Hmm we haven’t tried it but if you give it a try, report back on how it goes, Lesley! Good luck! Made this tonight with fresh Hood strawberries and my house smelled wonderful! Can’t wait to use in yogurt and overnight oats this week. Update: I just put a big glob of the compote on top of my chocolate mug cake, and that was a solid decision. Yes! How long does this list in the fridge? Hi! Up to 4-5 days. Freeze after that (which you can do in an ice cube tray for more serving-size appropriate portions)! I made this with strawberries and rhubarb. Fabulous! Thank you. You rock! Glad you enjoyed it, Claudia! love this fresh fruit compote. 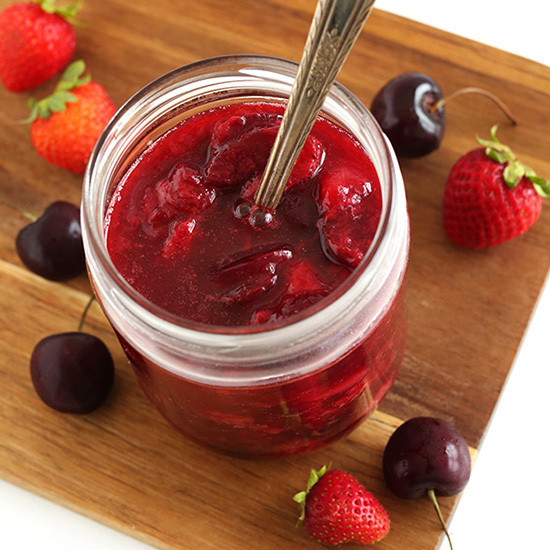 Have you ever made a compote from canned fruit that can be layered and then put into a dark place to ferment? 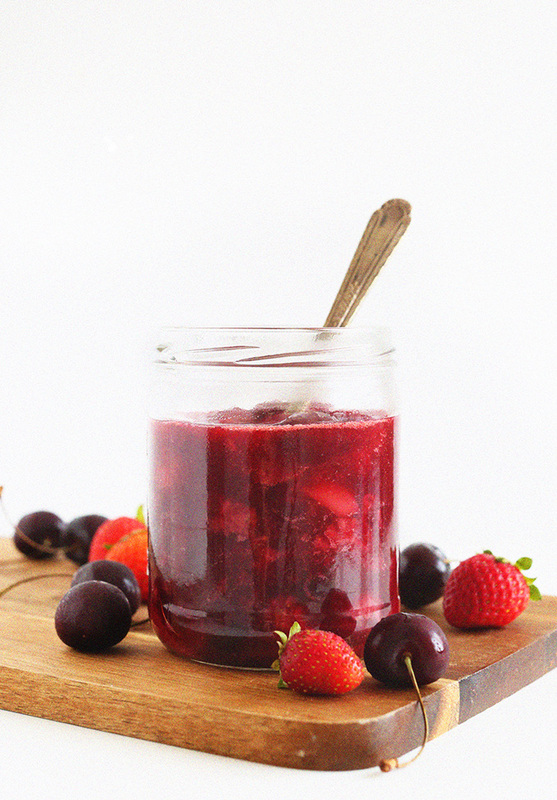 With ice cream, this compote is so delicious. Back in the mid to late 1960s to early 1970s this type of “liquor” was something of a “rage”. Any ideas about this? I also believe that this compote turned liquor could be made with fresh fruit too. Hi Nishma! Up to 4-5 days. Freeze after that (which you can do in an ice cube tray for more serving-size appropriate portions)! I made this today… so easy and good m, thank you for taking time to share. I MADE CREAM PUFFS IM MAKING WHIPPED CREAM THE LIQUID KIND, I’M THINKING OF FOLDING FRUIT COMPOTE TO WHIPPED Cream N FILLING Cream PUFFS WITH THE FRUIT COMPOTE N WHIPPED CREAM. WILL THAT WORK? Is the chia seed that need to added is ground? I made it, I loved it! Simple tasty, had it with cheesecake. Complimented each other well. Added all the extras, very flavorful. I made this when I realized I didn’t have any topping for waffles this morning. So simple and tasty! We love to turn our kompot into a juice! In a large pot we boil water and add fruit. We let the fruit boil for about a half hour let cool and strain out the fruit. We sometimes add sugar depending on what fruit we are using but it is a great way to control how much sugar we give to the kiddies! Just made your way and it came out great! Cant wait to make your coconut yogurt to pair with it! Hi! It will last in the fridge for up to 1 week! I am wondering about making a chocolate compote, do you know if it is possible to can a compote with chocolate in it? Hi Elizabeth! I am not sure as we have not tried it, but if you do, please let us know how it goes! Hi Elizabeth! I am not sure as we have not tried it, but if you do, please report back on how it goes! Hi Chalom! That should work! I have used fruit like this too without adding juice and placing it in the middle of phillo dough and crisscrossing the dough to make a strudel. It’s great. I have also used to make fruit tart cups with fresh whipped cream ontop. Tons of things you can do with it ? Hello! Love your recipes! Was wondering why you wait until the compote comes off the heat to add the chia seeds. I know those little suckers will soak up tons of the liquid but does heat change how they operate? Nice- I had fresh black raspberries from my garden, a few blueberries and strawberries, so I used those. Another recipe that I saw first used a little butter and brown sugar, and fresh squeezed lemon juice. Next time I will try honey. I also saw a hint that someone added a touch of Chambourd, which I had so added 1 Tb. I was delicious over my GF waffle! Thanks for posting. Enjoyed strawberry compote on my french toast this morning. Recipe was so easy to follow. All I used was o j and brown sugar ( about 1/4 c). Easy! Easy! Delicious! No need for syrup. Great recipe! I made my compote in the rice cooker with some peaches and plums that are in season along with a half cup of orange juice and a banana. The best yogurt topping ever! I cobbled together equal parts strawberries, raspberries, and apple chunks (note to self: peel the apples next time before cooking [I know, rookie mistake]) to come up with enough fruit for this compote and it is DELICIOUS. Sweet but not too sweet, a little bit of a kick, the perfect topping for chocolate pie! Such an easy recipe to follow, although I didn’t have orange juice so I used a couple teaspoons of lemon juice. I used some fresh strawberries and blueberries and put the compote in the bottom of half pint jars. Next I’ll add the creamy honey yogurt to the jars that I have incubating in my Instant Pot!! Can’t wait!! Thank you for posting your recipes!! Hi…. This looks super simple and yummy!! If we want to make it in a good season..how long will it last in the refrigerator?? Hi, looks fab! How long do you think this could last in the fridge in a sealed container? Thanks! Hi! You can store leftovers in a sealed bag or container at room temperature for 1 week, or in the freezer for up to 1 month. Happy cooking! I’m very late to this party, but fruit compote is so delicious I couldn’t help but comment: I live in cranberry country, and since fresh cranberries are so tart they’re near unpalatable, I’ve found they turn out best cooked like this. Pair them with strawberries and honey, raspberries and maple syrup, or my recent favorite, red grapes and apple cider! I just discovered strawberry compote and made my easy version using only strawberries and some spices. So yumms! Thanks for the ideas for how to use it. I think they will taste so yummy on waffles and maybe even on banana nice cream!! I need to make cherry cake with strawberry compote do you have a recipie for a strawberry and cherry cake? Hi Carin, we have a Strawberry Beet Cupcake that we love, have you tried it? Never knew it was this easy! Tastes great. Thank you! Made peach compote for pancakes using this recipe. So so very good! Oh my goodness so good and so easy! Made peach compote for pancakes. My, my, my! I made it with Lakewoo Organic Pure Cranberry Juice. It had no sugar, whatsoever, but I added extra sugar in my compote. I also put in some Lemon Extract, about 1/2 tablespoon. It came out delicious. I love finding recipes and experimenting with them. This is an awesome recipe! I am currently on the Whole 30 program and wanted something different to serve with my banana pancakes (bananas, coconut flour, eggs, cinnamon–that’s it!). I found this and used what I had in my fridge–blueberries and peaches. Loved it! So simple and tasty! Didn’t miss the sugar at all. This is a great way to use an overabundance of fruit, I am sure, and I will definitely make this again. Cheers! Those pancakes sound wonderful. The compote would be wonderful on it! Recipe please. I bought strawberries on sale 9 months ago. I trim the green leaves and stem, and simply purée them in a 1980s blender. I don’t blend it into water, but a little chunky. I add 4-5 packets of Splenda and I put them in a clean Ball jar and freeze them. I defrost a jar and have been enjoying them over the winter and I’m just finishing my last one from August. Now that’s it’s spring, I’m gonna do it all over. I am planning on making this tomorrow for breakfast however, I am wondering if I I could pour the compote directly onto the pancakes shortly after it has been made? Or do it have to be cooled in the fridge before to get a certain consistency? I’m excited to try this after watching the kids on master chef junior out me to shameeeeee. I never knew it was this easy! I went to go make some and saw my OJ box in the recycling. Can OJ concentrate be used and how much would you suggest? Thanks! I made this recipe using cherries and blueberries. I don’t really like orange juice, so I used peach concentrate (no sugar) and it came out great! How is this best stored and how long does it last for? 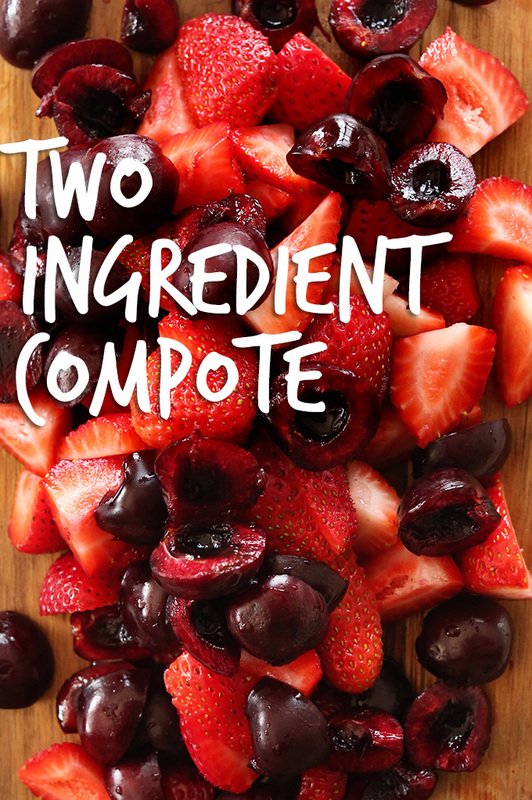 Love love this compote recipe. I pour this compote on top of whole milk plain greek yogurt. Mmm mmm such bliss! Even my 8 month old baby enjoys his yogurt with this compote! Just made this and added a splash of rum. Mmmmmmm! We hosted a waffle brunch for our family on Christmas Day yesterday and made your compote as a topping option. It was a huge hit! I used fresh strawberries and cherries (both in peak season here in Australia) and added 200 grams of fresh blueberries along with one teaspoon of demerara sugar and 1/4 teaspoon ground ginger. An instant family favourite. Thank you for the recipe. This looks so awesome, but I doubt much that my two little guys would warm up to the texture of cooked fruit. I suspect that I might whiz the whole business in a food processor and pour over pancakes or waffles. PS – I like your writing style. I really like the fruit compote what I used for my compote was diced strawberries ,persimmon fruit and for the liquid I squeezed some juice from two oranges i added some cinnamon alil sugar and butter and I topped over my cinnamon pancakes with cheese eggs and turkey bacon❤❤ ! I remember my mom doing compote and she would just keep it going, adding fruit now and then. I have her recipe and it clearly said to NOT refreidge and hers is a no cook. Mix a canned fruit (drained apricots) and almost 2 cps sugar and let sit 2 weeks, then add next one ( peaches) and sugar, wait 2 weeks, then repeat with pineapple and then maraschino cherries and wait 2 weeks each, then can use and keep it going adding fruit as like. I did the 1st step, and 1 week in it is molded. I was worried about fermenting causing too much gas and popping lid so had a container with an air escape. Really bummed about the mold. Has anyone ever done a no cook, fermented one like this? I had wondered about mold happening. I would love to do this version from my childhood. Suggestions??. I think your mum made rumtopf. Topping up with dark rum after each addition of fruit. That would prevent it molding. Hoefully im right. Thanks for replying. No I am sure there was no rum as we had no alcohol in the house and the recipe was very clear. Sigh, still looking…. Hi Dana. As an acupuncturist I often recommend clients to make chunky compote and eat with a spoon as a dairy free alternative to yoghurt. This is such a lovely recipe thank you for sharing. I live in Kenya and with ref to a previous post on your site, pineapple and ginger compote or tree tomato and passion fruit compote (I think you guys call tree tomatoes tamarillos) are great tropical alternatives to berries. Have you tried coconut yoghurt? I was looking for a recipe and came across this blog … she has a wonderful recipe for it which had a link to this compote as a suggested serving idea … win – win!! Are there any tropical fruits that you recommend for use in compotes? Can bananas go into compotes? This looks perfect to pair with my morning oatmeal! How long will it last in the refrigerator? Excellent, simple recipe! I used fresh-picked blueberries and some cherries and the optional cinnamon add-in for our pancake topping this morning and it was a hit! So delicious and easy to make! Thanks for sharing this recipe–we will be using it a lot, I suspect, with the 18 lbs of blueberries we picked yesterday! was just wondering how long this is good for kept in the fridge? I’d say up to 1 week, often times more! This sounds amazing and super simple! I have a family member that has a lot of cherries to get rid of, would this be able to be canned? I’ve never canned, but I would think so, yes! So I plan on making a black-forest cake for my dad’s birthday using a recipe that I tried back in November for mom’s birthday. Everyone LOVED it, so am pulling it out again. This time, I would like to use a compote/jam instead of Ed’s pie filling. Based on the recipe, how much compote do you think I should make? Plus, is there anything else that I could use instead of orange juice? You can sub any other juice. As for the amount, it’s hard to advise because I’m not sure what size of cake you’re making. But the good news is, if you make extra you can use it on waffles and everything else breakfast related! It’s kind of a win win. Best of luck Laura. Sorry, I forgot to rate your recipe! 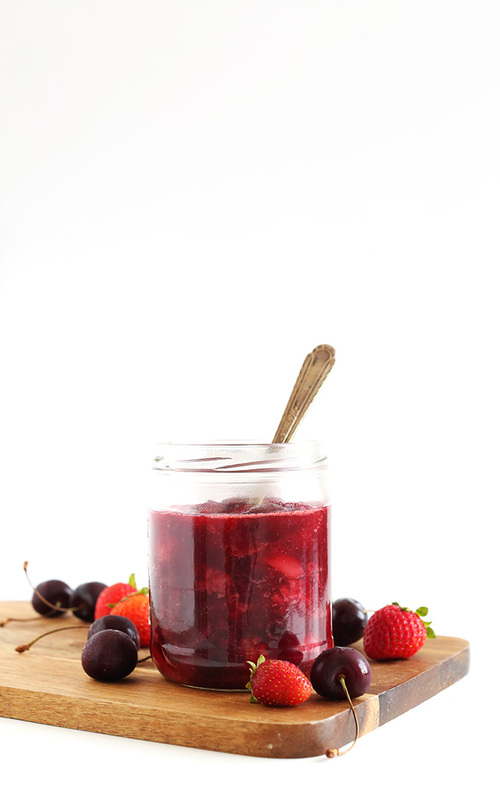 BERRY PIE CRAVING – compote to the rescue. I was desperate for some kind of berry pie quick. Having no pie crest ready and wanting a quick dessert, I made my first compote. I cooked mine in the microwave for 3-4 minutes, cooking the apple for 3 and added the blackberries in the last minute. this compote did not disappoint. One satisfied Mama here. I used 1 fresh apple, 1/2 cup if blackberries, 2 tbls of brown sugar, cinnamon, and 1 tsp. vanilla. Add apple, peeled, cored and sliced in 2 inch pieces in a microwavable bowl, add 2 tbls. of brown sugar, 1 or 2 tsp of vanilla and a generous sprinkling of cinnamon, 1/8 cubp of water (or any juice you have on hand). Cook on high for 3 minutes. Add blackberries for the last minute. Made this to go over Japanese hotcakes! Was superb. Used apricots and bananas. Super simple. Great! Thanks for sharing, Kayla! I used this recipe with blueberries and raspberries to fill some chocolate cupcakes! SOOO good! The perfect christmas breakfast – Panettone French Toast with fruit compote and whipped cream! I cook mine with a little butter and coconut oil… I think it lets it caramelize a bit… sometimes I add a little sherry. Great and simple recipe! When using frozen fruit, do they need to be thawed first? Mmmm I made this for a weekend brunch — from fresh fruit from our Farmer’s Market! It was a big hit. Omg. A waffle party. Of course. That sounds like so much fun! Also I make this kind of sauce all the time for French toast! It’s my favourite sweet breakfast topping. Just made this to go on waffles for breakfast. Delicious and so easy! I love that there’s no added sugar. There’s no need! I used blueberries and blackberries. Fabulous. Yay! I have a waffle recipe coming soon, so stay tuned! Just made a tasty batch of strawberry/blueberry. How long will it keep in the fridge? Up to 1 month (often longer). Lovely! That’s such an awesome idea… I hope I get to host a “waffle bar” someday! Love the waffle bar idea… what a fun idea for a party! THE POWER OF THE COMPOTE. When it comes to waffles, kicks syrup in the face if you ask me. And if you’re always running out the door like moi, you do this entire thing in the microwave. I’ve never made it with orange juice though, always honey, great tip to mix it up! I am brining my mini-waffle iron, waffle mix, and toppings for a work brunch tomorrow. I was just going to bring fresh strawberries an raspberries, but will have to try to make compote. Like the idea of using honey and the microwave too since I won’t really have time to make it on the stovetop. Amazing recipe, thank you ! The problem is, I can’t find Chia seeds where I live. Can I use ground flaxseeds instead ? I actually have hosted a waffle brunch! It was great fun, but would have been way better with this compote. So I guess that means I’ll have to host another! Oh this sounds/looks amazing! I was just trying to figure out what to do with the last of a rather large batch of peaches. You may have just given me my solution! Compotes have always been something that I was afraid of because of the big fancy name… I never knew that they were this easy to make! I seriously want to contribute to a waffle brunch now! DO IT. Waffle brunch, for the WIN! A waffle brunch sounds like so much fun! This compote would make a delicious topping. I’ve made compotes before but only ever thought of using them on ice cream. Great idea! Do it! Rogue frozen berries are ideal for this! Love how simple this recipe is, and especially how you used orange juice as the sweetener. I find that nature’s candy (fruit) rarely needs added sugar! I bet this compote is wonderful on top of waffles. Agreed! I have some waffles coming soon that you’ll want to cover with this compote! Oh, this looks fantastic! I am going to make it this weekend. Do you think it would work to add in some fresh basil or mint with with fruit or would the herbs get weird heated up? Um YES. Do it! It will make this even more delicious. With the addition of herbs, however, add them at the very end of the cooking time, and the sooner you can use the compote up the better! Which herbs did you try? I tried thyme and it was very yummy. Wow I never heard to a compote before and now I need to try and make one. That would be great poured over my pancakes in the morning. I love compote. I’ve found sometimes the fruit has enough juice and no extra liquid is needed. Just fresh fruit! A fabulous way to use up the fresh summer berries. I love the waffle party idea. I’m filing that away for the future. I’ve been wondering about compotes! This sounds delightfully delicious; I’ll wonder no more!